A medieval psalter was divided into sections according to one of several traditions. 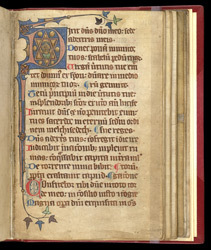 The psalter from St Giles has the eight-part division, the last at Psalm 109 (110, "The Lord said to my Lord"). This psalm was sometimes singled out for special decoration pertaining to the Trinity, as here, with a picture of either the Father or Son portrayed within a six-pointed star. Now associated with Judaism, the Star of David appears in medieval times at least as frequently in Christian and Islamic contexts as an amulet or magical symbol. Perhaps its use here related to the healing profession of the ministers at St Giles: charms and prayers were part of treatment.